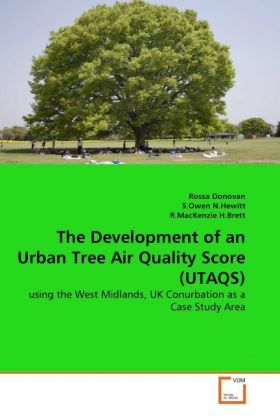 This book investigates the feasibility of using trees to improve urban air quality using the West Midlands, UK conurbation as a case study. Data from a random, stratified field survey has been used to estimate the physical attributes of the West Midlands urban forest. An atmospheric chemistry and transport model (CiTTyCAT) is used to model the combined effects of pollutant deposition to, and the emission of biogenic volatile organic compounds (BVOCs) from the urban forest. While all trees can be beneficial to air quality in terms of the deposition of pollutants, some trees are responsible for the downwind formation of ozone due to the reaction of BVOCs and nitrogen oxides. Model scenarios are used to develop an Urban Tree Air Quality Score (UTAQS) that ranks trees in order of their ability to improve air quality. Of the 30 species considered, pine, larch and silver birch have the greatest ability to improve air quality, while oaks, willows and poplars can worsen air quality if planted in very large numbers. The UTAQS classification is applicable to all urban areas of the UK and other mid-latitude, temperate climate zones with common species to the UK.